In 1614, Captain John Smith sailed into Massachusetts Bay. He brought friendly greetings and lots (and lots) of disease: over two-thirds of indigenous locals were dead by 1618. So Boston, while not technically founded until 1630, was a town of uneasy ghosts even before the first “witch” was hanged on the common in 1648. A few centuries on, Boston’s cobblestone streets, grand old hotels, and mouldering graveyards are full of spirits. This Halloween, why not check out some local haunts that are actually haunted? Boston’s most notoriously haunted building features an elevator that makes its own stops on the third floor (which it’s been doing since an actress died there in 1876); a long-dead owner, Harvey Parker, who wanders the halls in eternal concern for his guests’ happiness; and glimpses of Charles Dickens in a mezzanine mirror. So who knows which one is going to be responsible for waking you up in the middle of the night? Speaking of Dickens, even if you can’t snag a room, you could grab dinner at his beloved Parker House restaurant, home of Boston cream pie and Parker House rolls. 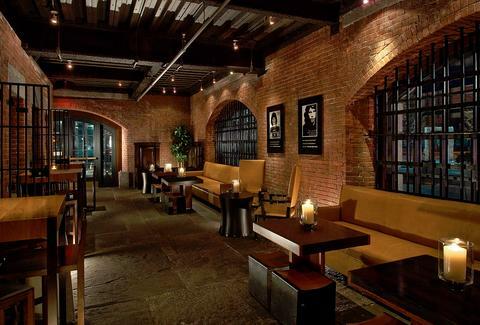 Boston’s Charles Street Jail was remodeled into a luxury hotel that relishes its roots; the cellblock rooms and original catwalks lining the atrium remind you that a prison always has stories to tell. For instance, a captured German U-boat captain killed himself while imprisoned here in 1945, and one can only imagine what was going through Malcolm X’s head during his time inside. When a court ruled that conditions here were so poor that they violated the prisoners’ constitutional rights, it took nearly 20 years to relocate the inmates. For more on the history of the old jail, ask for a tour at the concierge desk. Afterwards, grab a drink at Alibi -- probably the only time you’ll ever be able to get a drink in a drunk tank. 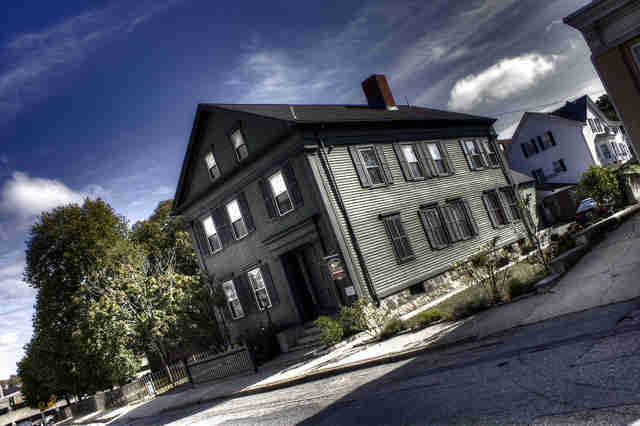 Ghost hunters and lovers of the macabre have long frequented Lizzie Borden’s home. Although she was the only suspect in the bloody 1892 double murder of her parents, Victorian society seemed unable to believe that a woman was capable of an act so brutal. Lizzie was acquitted of the murders and spent the rest of her life in seclusion. It’s worth the half-hour drive south of Boston to take a tour for all the details. Stay overnight if you dare... just don’t stand too long in the middle of the room where Lizzie’s stepmother was killed. This perfectly preserved WWII heavy cruiser is a beloved staple of the Boston museum circuit, and happens to be scary AF. That’s official, courtesy of Ghost Hunters. 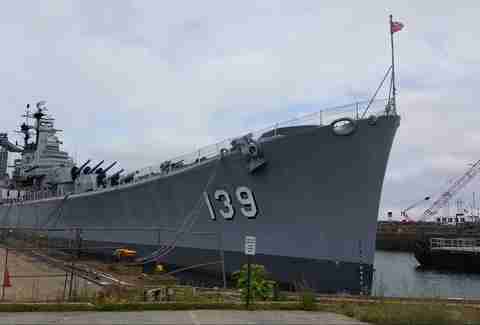 The ship’s well-documented hauntings include apparitions, disembodied footsteps, and the noises of a crew working on an empty ship, all of which may date to the USS Salem's stint as a hospital and morgue for disaster victims in the 1950s. But if ghosts don’t scare you, maybe zombies will: this year, the Salem is being transformed into a haunted tour that definitely beats a hayride. Ghost Ship Harbor gives you three different tracks to explore a plague outbreak scenario in which the ship is humanity’s last hope. Don’t bring kids. Rumor has it that long-time patron John F. Kennedy still haunts the walls (and, according to some reports, the washrooms) of America’s oldest continually operated restaurant. The Oyster House has its share of tourist kitsch at this point, but the low ceilings and cramped corridors do evoke earlier, darker times. Plus, the chowder’s not bad. No need to trek out to Salem for some witch-trial lore: the first victim of that terrible time was actually hanged right here in Boston. Margaret Jones, a once-beloved healer, was accused of using witchcraft in her medicines. Confined to the Boston jail so that “evidence” could be collected, a witch-watcher claimed he saw a child run from her arms and disappear into thin air. Jones was hanged on the gallows tree on Boston Common in 1648. The only artifact remaining of the original hanging tree and the gallows is a small plaque near the park’s Frog Pond, so good luck finding that in the dark. On the bright side, as you’re looking, you might pass the ghosts of two Victorian sisters who have often been seen wandering the Common arm in arm. 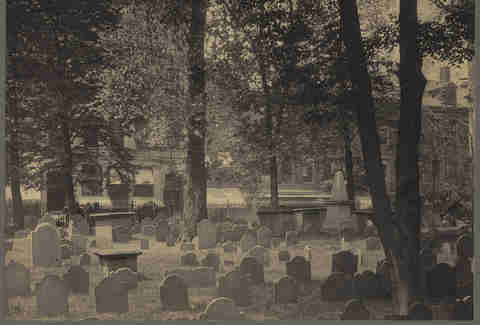 Boston’s oldest cemetery (1630) is the resting place for many hallowed bones. Or at least it should be -- the dead don’t lie quiet here. 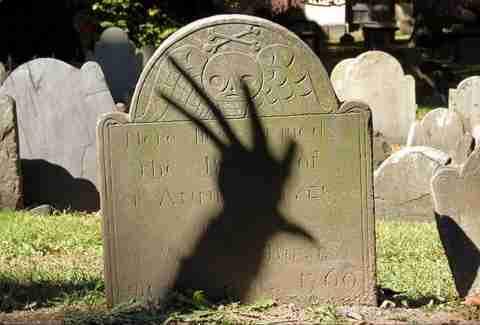 Grave diggers once beheaded a dead woman to make her fit in a too-small space, one man may have been buried alive, and the stones themselves have been moved twice (a surefire recipe for restless spirits). Visitors frequently report the sensation of being watched. Founded in 1660, the Granary is home to famous dead people like Samuel Adams, John Hancock, and Paul Revere. Photos taken here often exhibit strange orbs and spectral figures, and many visitors have seen a Revolutionary War-era ghost presumed to be unfortunate lawyer James Otis, Jr., who was brain-damaged by a vicious attack. He told his family he would rather be struck dead by lightning -- and was shortly thereafter struck dead by lightning in his own home. With one mass grave for children, another for Boston Massacre victims, and the fact that many of the Granary’s stones were rudely rearranged to improve landscaping access, Otis is bound to have plenty of company. Dr. John Webster stabbed Dr. George Parkman to death in 1849 to avoid paying back a debt. He tried to cover it up by dismembering and incinerating the body, but thanks to an enterprising janitor, a privy, and a few teeth, the truth eventually came out. The sensational trial made history as the first time forensic evidence solved a case. For a unique experience, check out this app that uses video storytelling to guide you through nearby sites involved in the murder. 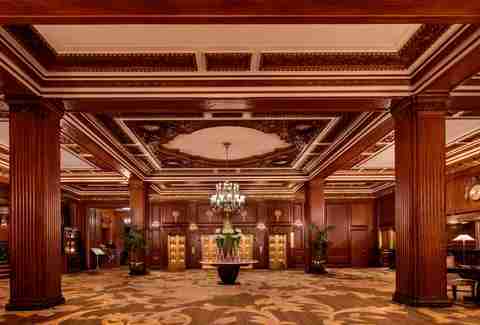 This boisterous spot may not come across as a likely favorite of ghosts, but there’s no better place to toast the dead. Some of them met their fate right where you’re ordering your Negroni, thanks to public executions held on these grounds throughout the 17th century, so watch out for cold spots. 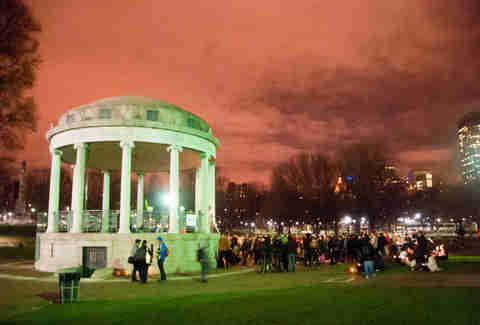 Sober up afterwards by wandering over to the city’s other gallows ground -- Boston Common. While most of Harvard is closed to tourists, enough of the old brick buildings have haunted pasts, so you might feel their presence in the shadows outside. 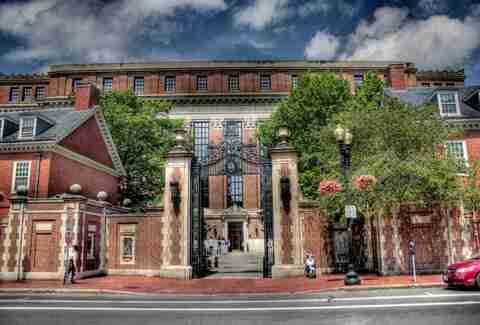 For instance, Widener Library was founded by Eleanor Widener when she lost her book-loving son Harry to the sinking of the Titanic. The building literally started coming apart when Harry’s portrait was moved; the problems stopped when staffers taped a photocopy of the portrait up in its place. Take a walk through Harvard Yard and out to the Old Burial Ground nearby, and for details on several bonus haunted stops along the way, check out this handy map we made for you. Fair warning: ferry service from Boston ends for the winter on Columbus Day, so in the colder months, you’ll need your own boat -- but it's worth finding one. 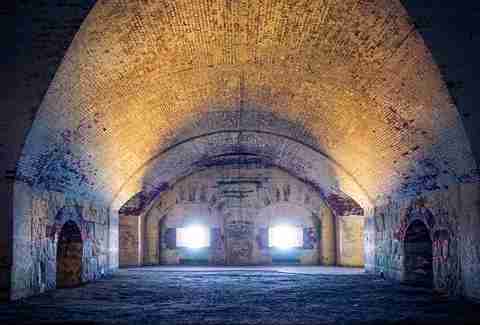 The cold, echoing chambers of old Fort Warren are creepier than most haunted houses. Stairs sometimes end blankly in a stone wall, and many passageways are so dark you have to feel your way through. Maybe a beam of light through a deep-set window will give you a glimpse of the Lady in Black: legend has it that the wife of a Confederate soldier who was imprisoned here snuck into the fort disguised as a man, tried and failed to rescue her beloved, and was hanged for it. Bonus haunt: While you’re on the 30-minute ride back to town, keep an eye out for Nixes Mate. Capped by a 20ft-tall pyramid, this shoal is where pirates and mutineers were put to death in Boston’s early days. There have been sightings aplenty of strange figures on the rocks. Margaret Collins always enjoys a good ghost story, perhaps because she once spent the night on board the USS Salem and it scared the bejeezus out of her. Check out Salt Sweet Bitter for her musings on food, life, and the real-life terror of finishing a novel. Gramming it at @mec623, Yelping it at margareteats.